It’s time to install your server and come to find out someone has tossed the rail kits. After hours, days, or even weeks of searching you find out that the OEM rail kits are no longer available. At this point, frustration sets in and you are afraid your only option is to stack the server on top of another server. One option is to put the server on a shelf but this usually means wasting a U space just for the shelf. Another option is using non sliding rail kits. 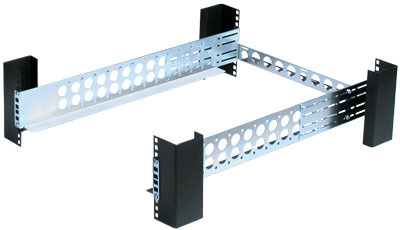 These rail kits are compatible with practically all racks, including 4post and 2post racks with round or square holes. You can still easily slide the server in or out of the rack for maintenance. The rails kits just do not telescope in front of the rack like a lot of original rail kits. This entry was posted on Thursday, October 18th, 2007 at 9:13 am	and is filed under Popular, Rail Kits. You can follow any responses to this entry through the RSS 2.0 feed. You can leave a response, or trackback from your own site.